Pop. 343. In Raleigh T., Kent C., on C. Rds. 3 & 10, 19 km SE of Chatham. Pop. 282. In Raleigh T., Kent C., on L. Erie and Hwy 3,23 km. SE of Chatham. Pop. 600. In Nelson T., Halton C., on C. Rds. 7 & 536,10 km S of Milton. The first settler was Thomas Simpson, who arrived in the late 1820s. In East and West Flamborough Ts., Reg. Mun. 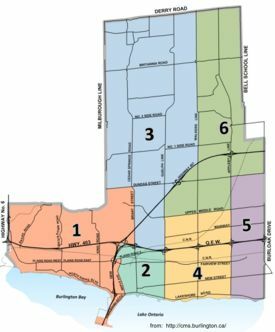 of Hamilton- Wentworth and Hwys 5 & 6, 7 km. NW of Hamilton. Pop. 320. In Flamborough T., Reg. Mun. of Hamilton-Wentworth, 3 km NE ofHwy 6, 11 km N of Hamilton. Pop. 8,000. In the Reg. Mun. of Hamilton-Wentworth on Grindstone Cr. and Hwy 5,8 km N of Hamilton. Pop. 350. In the Town of Flamborough, Reg. Mun. of Hamilton-Wentworth on Hwy 6,12 km. NW of Hamilton. Named Mill Grove in 1852, the words were combined in 1980. Pop. 31,406. In the Reg. Mun. of Halton, on Sixteen Mile Cr. and Hwy 401 and C. Rd. 25, 53 km. SW of Toronto. Pop. 147. In Nassagameya T, Reg. Mun. of Halt on on C. Rd. 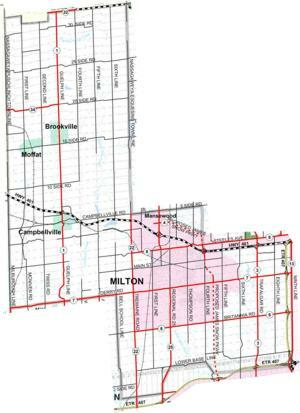 1, 17 km W of Milton. The name was approved in 1935. Pop. 720. Part of the Town of Milton, Reg. Mun. of Halton, on Sixteen Mile Cr. and C. Rds. 1& 518,just S ofHwy 401,9 km. SW of Milton. Pop. 132,772. City in the Reg. Mun. of Halton at the end of L. Ontario on the QEW and C. Rd. 1, directly N across the bay from Hamilton. Pop. 245. 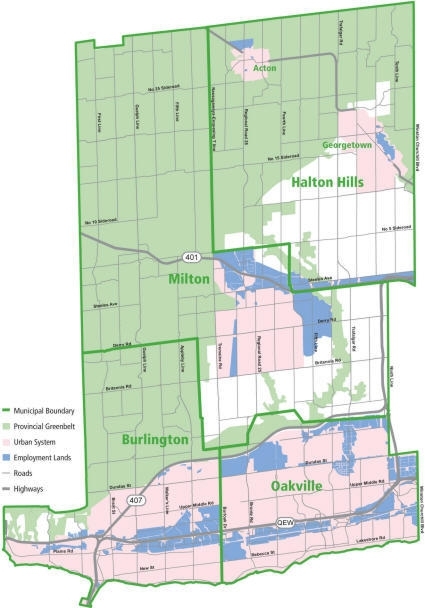 Part of the City of Burlington in the Reg. Mun. 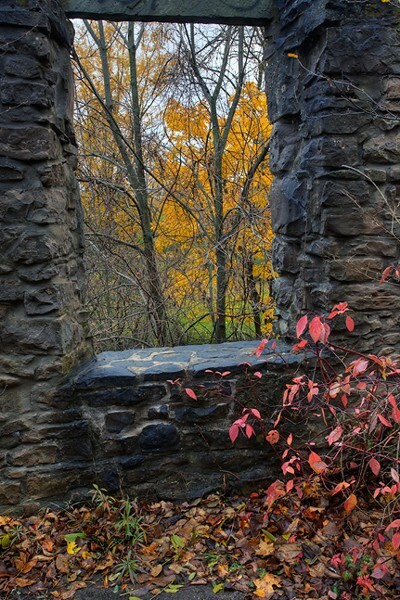 of Halton on Twelve Mile Cr. and C. Rd. 1,15 km. NW of Burlington. Pop. 1,000. In the Reg. Mun. of Hamilton-Wentworth on Hwy 6 and C. Rds. 97 & 504, 25 km. NW of Hamilton. op. 23,036. In Reg. Mun. of Hamilton-Wentworth on Hwy 8, 6 km W of Hamilton Harbour at the west end of L. Ontario and 3 km W of the City of Hamilton. Pop. 2,500. In Reg. Mun. of Hamilton-Wentworth on Glen Cr. and C. Rd. 504, 1 km. N of Hwy 8, 4 km. NW of Dundas. Pop. 267. In Puslinch T., Wellington C., at Hwy 6 and C. Rd. 36,1 km. S ofHwy 401,16 km. SE of Guelph. Pop. 269. 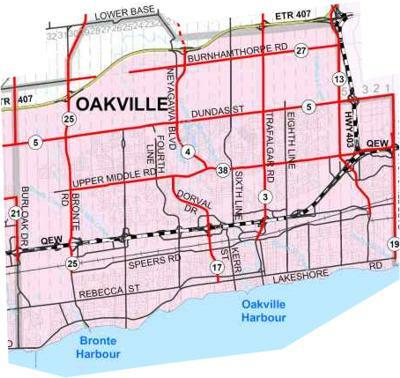 Part of the Town of Oakville, Reg. Mun. of Halton, on C. Rds. 5 & 25, 15 km NE of Burlington. Pop. 123,895. In the Reg. Mun. of Halton, on L. Ontario at the mouth of Sixteen Mile Cr. and on the QEW and C. Rd. 3, 35 km. SW of Toronto and 35 km. NE of Hamilton. Pop. 30. In Puslinch T., Wellington C. on Hwy 6, 4 km. SE of Hwy 401, 18 km. E of Kitchener.